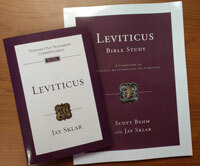 This study is meant for use alongside your Bible and Jay Sklar’s Leviticus: An Introduction and Commentary. Perfect for individuals or groups, it will help you to understand: • how to read Leviticus and apply it to your life today • the relevance of unfamiliar cultural concepts (such as ritual impurity) • the meaning of key themes (such as holiness, sin, atonement) • the significance of Jesus as atoning sacrifice and faithful priest on our behalf. Do the whole study (32 weeks) or choose from 12-week studies such as: • The Gospel in Leviticus • Jesus in Leviticus • Sacrifice and Worship in Leviticus • Holiness in Leviticus • Community and Ministry in Leviticus • Ethics and Mission in Leviticus. Are you willing to give Leviticus a chance? We dare you. It really is a treasure trove of meaning and hope for those who do! Scott worked as a lawyer on the West Coast for more than 20 years before he and his family decided to move across the country to St. Louis so he could attend Covenant Theological Seminary. There he met Jay, a professor of Old Testament who—for reasons most people don’t understand—had a deep love for Leviticus. After Scott graduated, they worked together on this study for more than a year, with Scott doing the lion’s share of the work.